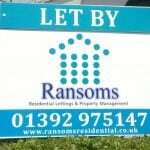 We would like to to say a huge Thank You to the Devon Pixels team for allowing Ransoms Residential the opportunity to guest blog about our new company here in Devon. We simply provided what we wanted to say and Devon Pixels took our words and created a blog that looked fantastic! They then promoted our blog with immense enthusiasm through social media which had an instant and positive affect in gaining much needed exposure. YOU should not “consider” guest blogging with Devon Pixels. YOU should just do it! We can’t wait to do it again!